Ever since I was a wee little cook ripping up my first chives, burning my first steaks, and toughening up my first squid, I'd dreamt of poultry-stuffed-poultry-stuffed-poultry. The idea of a Turducken—a chicken stuffed into a duck stuffed into a turkey—is just so damn appealing. How could three such glorious birds not taste all the more glorious together? Kirby-esque visions of ducks sucking up whole chickens, acquiring their powers, only to be sucked up by a turkey to create one mega-bird danced through my eyes. I could taste their fats co-mingling on my palate. The history of the turducken is relatively modern. Some attribute it to Paul Prudhomme, the legendary Louisiana chef who also brought us blackened fish, while others say it was first made at Hebert's Specialty Meats, also in Louisiana, but all place its time-stamp at somewhere in the 1980's. But as a concept, animal-stuffed-animal roasts have a pedigree that reaches back at least to Roman times, when roasts could use as many as two dozen different beasts of ever decreasing size. How romantic. Part of the appeal is the surprise. A perfect turducken should arrive at the table looking just like a regular old turkey. It's only upon carving that guests are given the first clue: rather than trying to navigate the confounding curves of a breast bone, a carving knife slides cleanly, smoothly through the entire boneless wonder, exposing the layered meat and stuffing within. I so wanted to make one, so make one I did. The dream all came crashing down within the first few bites. Sure, that turkey-esque beast looked impressive on the table, its misshapen sides bulging out like uncooked bagel dough, cornbread and sausage stuffing comingling inside with no attention paid to the boundaries the various birds were supposed to be setting up in there. But there was no way that even the most optimistic of holiday feasters could have pretended it was as tasty as roasting each of the birds individually. Gorgeous, right? Grandpa in the back is keeping mum. The turkey was dry as a bone, the duck skin completely unrendered, fatty, and chewy, the flavors a mish-mash of competing ingredients. I, along with my entire family, ate the thing, smothered in gravy, washed down with plenty of red wine and hubris. I chalked it down to poor preparation, and spent the next couple of years trying to perfect my technique—cooking at a lower temperature, trussing and stuffing more carefully—but kept the same basic method intact. Things never got significantly better. Then, in 2007, I came to an even more shocking realization after tasting every major brand of mail-order turducken available: They were all dry. Dry turkey and overcooked duck. Poultry needs to be cooked to between 140°F and 150°F*. Below that, and it's got a mushy texture and is dangerous to consume. Let it heat up above that, and it dries out irretrievably. How do you cook a chicken in the very center of a duck and a turkey to 140°F without overcooking the turkey or duck? You don't. In every recipe I tried, the turkey ended up hitting upwards of 170°F by the time the chicken was cooked through. Misshapen appearance. It's not easy to wrestle with three birds and three layers of stuffing. No matter how carefully you truss or tie, it ends up kind of... blob-like. Rather than opening neatly when sliced, it sort of spills out, as it the turkey skin were a sand-stuffed ballon. The duck skin is too fatty. As water-dwelling creatures, ducks have a ton of fat for insulation. Duck fat doesn't start to render until well above the temperatures that you want to cook either duck or turkey meat to, which means that once it's stuffed inside the turkey, it stays there, rubbery, fatty, and unappetizing. The flavors are muddled. Three birds, three different stuffings (one in the chicken, one between the chicken and duck, one between the duck and turkey), it's impossible to get a clear, clean, flavor out of the chimeric beast. *The USDA recommends significantly higher temperatures for roast poultry, but given proper resting, 150°F is perfectly safe. My goal for the last few years has been to try and solve every one of those problems. This year, I finally succeeded, producing what is perhaps the finest roast to ever emerge from my oven. Turkey meat that gave its juice away freely to anyone who asked. Perfectly rendered duck fat, tender to the teeth. 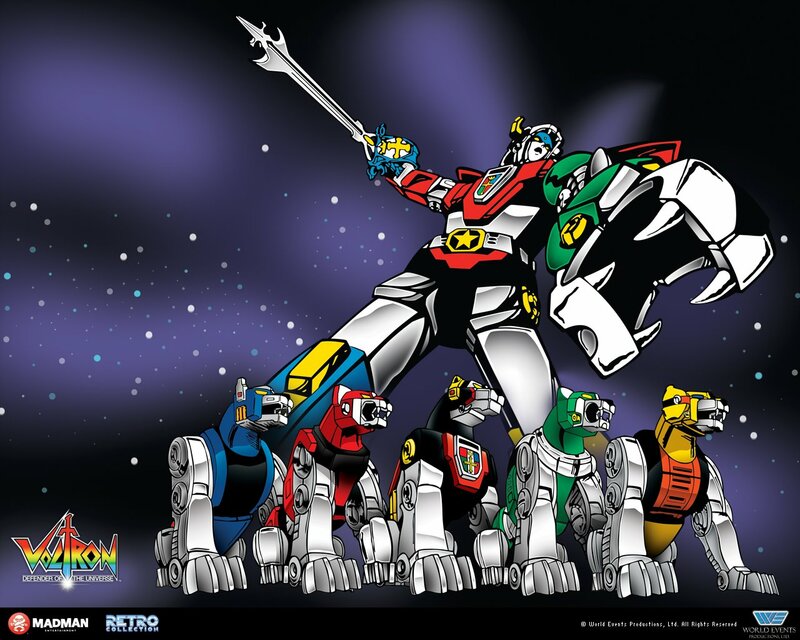 And flavors that blended as harmoniously as robotic lions joining forces to save the universe. Here's how it's done. (Click here for a step-by-step slideshow). The most difficult part of a turducken is boning out all the birds. With the chicken and the duck, this means removing every single bone while still keeping the skin in one intact sheet. Seems like an impossible task, but it's in fact remarkably simple once you get the hang of it. The key is to realize that you barely use a knife at all. The knife is used to remove the wish bone, to slit the back, to cut the joints at the wings and thighs, and to scrape meat from the leg bones. That's all. Everything else is done by hand. For full step-by-step details on how to do it, just check out the slideshow here. Once all that's done, we come to the question of stuffing. Classic New Orleans-style recipes call for three different stuffings in the birds. There's no strict rule as to what they are, but they usually involve a cornbread stuffing, a rice stuffing, and an oyster-based stuffing. I've tried all of those, as well as a classic sage sausage bread-based stuffing, one with dried fruits, and a few other variations in between. At first, I thought the problems with the stuffing were limited to simply balancing flavors—a tough task in and of itself. Eventually, I realized that the stuffing was part of the problem when it came to the structural integrity of my roast. See, while meat is made of strongly interconnected proteins that set into shape as you cook them, stuffing has no such shape-holding power. Even in a fully roasted turducken, that stuffing is soft and malleable, causing the bird to deform (and therefore cook unevenly), and looking totaly unattractive as it spills out onto the cutting board upon carving, like a late night partier reacquainting himself with his dinner on the sidewalk. So if a grain-based stuffing is the problem, why not just switch to an all-meat stuffing? Forcemeats like sausage or pâté are common stuffing choices in classical French preparations (like galantines or ballotines) for this very reason. Swapping out my bread stuffing for sausage (I used bulk sage sausage) was a huge step in the right direction, instantly solving my flavor issues, though initial shaping of the bird was still not particularly easy. For now, I decided to move on to getting the darn thing to cook evenly. The thing with roasts—and I apologize if you feel this is too obvious to even be worth mentioning—is that they cook from the outside in, and gradually approach the temperature of their surrounding environment. But this poses a problem: It takes a long, long times for a big roast to equilibrate in a lower temperature oven. We're talking 12 to 16 hours at 150°F here, folks. That's a major commitment. What's worse is that it's not safe. While a large, single piece of meat like a prime rib roast is clean and sterile on the inside and can thus be cooked low and slow with little to no risk,** this is not the case with a turducken: dangerous bacteria on the surfaces of the inner birds or in the sausage are trapped in an almost ideal environment for bacterial growth. I'm not squeamish when it comes to food safety, but even I'm not brave enough to eat 12 hour incubated chicken. I'd have to find a better way. Then it occured to me: if I wanted the inside to reach its final temperature at the same rate as the outside, why not just cook it from the inside out? The unique three-tiered structure of a turducken allows you to do exactly that. Rather than stuffing a raw chicken into a raw duck into a raw turkey, this time I stuffed my chicken with sausage, and sealed it in a cryo-vack bag (I've used butcher's twine nearly as effectively). I then proceeded to poach it in warm water until the very center of the stuffing hit between the 140 and 145°F mark. I then immediately and rapidly stuffed the still-warm chicken inside the boned duck. The par-cooked, sausage-stuffed chicken stays firmly in shape and is easy to handle, making wrapping the sausage-stuffed duck around it a relatively simple task (made even simpler if you use a plastic-wrap sling to help shape it). From there, the process is repeated—the chicken-wrapped-duck is vacuum-bagged (or trussed), and poached until the duck cooks through. The great thing is that because the chicken is already warm when it goes into the duck, it stays that way as the duck cooks. You really only need to wait for the duck's stuffing to come up to 140 to 145°F, and ensure that the chicken and sausage in the center doesn't dip below 130°F during that process (there was not even a remote threat of this happening any time that I tried this method). I zipped my poached ducken up inside my turkey (for this layer I skipped the sausage stuffing, since the turkey was already pretty full as-is), sealed the sucker with skewers (far easier than the awl-and-kitchen-twine method I've attempted in years past), trussed the turkey, and roasted it until the skin was a golden brown, and the turkey meat was at 145°F, again monitoring to ensure that the duck and the chicken stayed amply warm to avoid any danger of nasties breaking about (about 130°F). The result was a burnished beauty that emerged from the oven looking just like a regular roast turkey, but revealing layer after layer of perfect cooked meat inside. But one problem still remained: that confounded flabby duck skin. Just fry off the duck before wrapping it in the turkey. A good fifteen minutes worth of rendering and browning inside a skillet resulted in duck skin that was not only thin and completely tender, but also added some great flavor to the mix. It was so beautiful as-is, that I was almost tempted to serve the crispy ducken as a smaller roast in and of itself. I'm now tempted to develop a recipe for a miniature Duck "Porchetta". Added bonus: plenty of rendered duck fat to fry your potatoes in. With that final tweak in place, I finally had it. This year, my Thanksgiving table is going to be graced with the ultimate Thanksgiving roast. A three-bird, four-beast, hedonistic extravaganza that not only looks and sounds impressive, but eats better than any turkey, duck, or chicken you've ever had. I'm not going to lie: it's not a quick project, and it takes a bit of practice. Your first turducken may have some issues with its figure or internal alignment. But nail this recipe, and you will forever be known in your family as the king (or queen) of the holiday table.